Turquoise is a shade of blue that lies on the scale between blue and green. It has characteristics associated with both of these, such as the calmness of blue and the growth that is represented in green. Turquoise can also has the energy that yellow transmits, becoming an uplifting color. 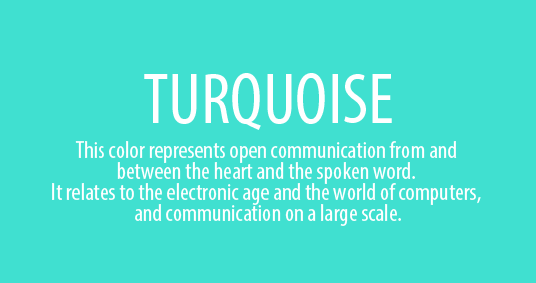 Let’s take a look at the associations turquoise has. Turquoise is similar to aquamarine and has a strong link to the color of the ocean. As such, it can be connected to calmness and peace. Turquoise is a color that balances blue, green and yellow, but it also can be linked to emotional balance. Looking at this color gives a feeling of serenity and stability. Like blue, it can be associated with clarity of mind and creativity. This is a color that encourages reflection and focusing on one’s own needs, thoughts and feelings. It can be connected to a higher self-esteem and love for oneself. However, it can also be a color related to aloofness and being too self-centered, leading the person to shutting out other people. Turquoise is related to serenity, but it can also be related to a focus on the spiritual and the intellectual aspects of the person over emotions. Turquoise doesn’t encourage emotional expression and can transmit neutrality. Too much of it leads to coldness or indifference. Emotional control is important, but a lack of emotion can be dangerous. Turquoise is a lovely color with both positive and negative associations. It is linked to calmness, serenity and peace of mind, as well as to mental clarity. Turquoise encourages creativity. It is a color linked to the ocean. It is also associated with balance and emotional stability. Turquoise has the characteristics of blue, green and yellow. It can also be associated with introspection and emotional control. The negative aspects of turquoise are that it can lead to being self-centered and shutting out other people in favor of oneself. Another negative aspect is an excess of emotional control that can be perceived as indifference. Turquoise is my absolute favorite color. I can’t believe how much about this is true to my personality. It’s uncanny. Thank you for writing this! You’re welcome… and I agree with you regarding how color can be reflective of one’s personality. I wear a lot of Turquoise clothing, I love Turquoise jewelry and my bathroom is Turquoise….so true!!! I too,also love this color.It’s the main color in my livingroom and hallways .light turquoise with teal accents mixed with yellow/gold pairings .I love water ,and the sound it invokes in me ..peace ..of thought and feelings..grounds me..The two colors are very lively and mixed with wood ..feel earthy…Sun..water..lol…Thanks you guys for sharing….. I see every day a girl that always wear at least one peace in turquoise. I have tried to approach her, but she looks shy, afraid or close to others that don’t have her trust. Try wearing something turquoise to get a conversation going. You’d be surprised how colours attract, and they’re also great ice breaker! Be inspired. Be bold. Be turquoise😊.